Mustard yellow is THE color of the moment. Make the most of it with these fabulous frocks for your bridesmaids or for vibrant engagement photos! With a high slit in the skirt and dramatic low back, this ethereal chartreuse gown is on a whole other level. With fluttering sleeves and a flattering wrap waist, what more could you ask for? Crocheted lace and a tiered maxi skirt create the perfect bohemian classic combo. 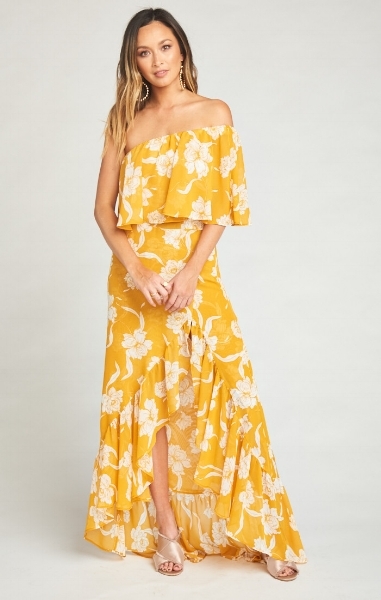 A unique take on mustard with pretty white floral. This sheer, casual gown with built-in shorts is the perfect fit for laid-back, boho beach vibes.